Supercars are fast and very expensive – two factors that can make supercar insurance high octane too. We all like to get good value for money when we take out insurance, but that’s not the only consideration when you‘re insuring a prestige marque. When you own a performance sports car you also want peace of mind that your car can be fixed by your choice of garage using genuine parts. And with prices for supercars spiralling upwards, it’s good to know that you can fall back on an agreed value if the worst does happen. Saving money is not normally the highest priority if you have a Ferrari, Bugatti, McLaren or Lamborghini in the garage. Instead, peace of mind that your treasured car will be cared for if the worst does happen is number 1. One of the biggest mistakes that owners of sportcars, supercars, and classics can make is to buy insurance in the same way as they purchase car insurance for their everyday vehicle. Yes, it can mean you pay more than you should. But more significantly, it can mean exclusions that result in you not having the level of cover you need. Can I buy supercar insurance on the internet? From groceries to washing machines, you can buy practically everything on the internet – and that includes car insurance. Online insurance sites have made it exceptionally quick and easy to buy car insurance. All you need to do is fill in a few tick boxes and complete your purchase. Whilst this can be fine if you drive around in a Ford Focus, it’s not always the best choice if your car is not a mainstream model. Many standard insurance comparison websites simply won’t be able to quote on high-performance vehicles. And if they do, you need to be extra vigilant that you’re getting the level of cover that you require. Instead, it can make sense to use a specialist insurer like Park Insurance. We can talk through exactly how you use your supercar to ensure you have the exact level of cover you need, at a value for money price. Is an agreed value policy the best option? Do I want to specify which garage will carry out repairs if my car is damaged? Is it essential that genuine parts or used for any repairs? Will I need track day cover? Am I driving in Europe or transporting my car to appear on a concours? Has my supercar been modified from factory standard, including cosmetic work? First of all, decide whether agreed value is appropriate for you. Even brand new supercar prices go up and classic supercars are considered an excellent investment, as well giving you driving pleasure. We understand that not all cars of the same model or age are worth the same amount. Low mileage models or ones with a racing pedigree or good provenance can be worth much more than the list price. Do I need an agreed value policy for my supercar? An agreed valuation means you agree in advance with your insurance company exactly what your car is worth. You may be asked to provide independent evidence of value and you’ll need to review this regularly as prices can increase significantly in short periods of time. The benefit of taking out an agreed value policy is that if you do need to make a claim, there will be no stresses or discussions over the value. Next, do you have a preference for where any repairs are carried out? When you own a supercar you don’t want to be quibbling over where to take your car if it needs repairs. Our insurance options let you choose to take your car to a garage of your choice. Only genuine parts will do when it comes to retaining your supercar’s authentic condition. With our insurance options, you can be confident that no corners will be cut, but genuine parts will always be used. What about if my car is worth less after an accident, even if a top-quality repair job has been carried out? In some cases, the value of your supercar can be reduced as a result of an accident, even if a top quality repair job is carried out. That’s because, as you know, collectors like vehicles to be as original as possible. If your supercar is an investment (as well as a lot of fun), you could add on insurance that covers you for any reduction in value if your car is damaged. What if my supercar is declared a write-off? Even if your car is declared a write-off, you might want to salvage it. Legally any car declared a category A or B write-off must be crushed, although in a category B write-off re-useable parts may be removed first. A category S write-off (previously known as Cat-C) indicates structural damage to the vehicle. Whilst a category N write-off means no structural damage, but can be applied to many cars where it is considered uneconomical to repair them, for example, because of the high cost of repairing electrics. A specialist insurance broker, like Park Insurance, can talk through your options so you can decide what to do. 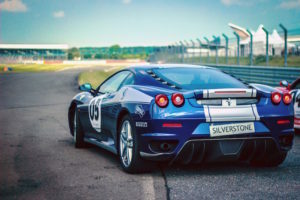 Insurance is based on risk and just the thought of your supercar being used on the track can make some insurance companies come out in a cold sweat. Many insurance policies will specifically exclude any racing or use off the road, for example on a track or disused airfield. But because our team at Park Insurance understand your passion, we’re also confident about covering your supercar on track days too. We’ll agree your excess for using your supercar on recognised track-days. And we’ll include high-level third-party cover for your peace of mind too. That’s because at specialist events you could be driving alongside some very expensive wheels! If you’re planning to take your car for a spin around the Nürburgring or take part in a rally, like Gumball, you’ll also need to let your insurer know. That’s because these are often excluded from policies, even if track days are included, because of the risk and the added costs if something does go wrong. But don’t worry, we can arrange cover specifically for these events. If you exhibit your car on a concours you may be transporting it around the UK or shipping it overseas. Damage doesn’t just occur on the road, it can also happen whilst your vehicle is in transit. So, if you’re planning on displaying your car make sure your insurance policy covers it on its way to the event and during it, wherever this is in the world. How much will it cost to insure my high-performance sports car? Supercars are considered non-standard for most insurers. A high-performance sports car automatically represents a higher risk to them, and that translates to higher insurance premiums. But we understand that supercar ownership is a passion. Turbo charged engines, don’t necessarily mean dangerously fast driving and they are not normally the only car that you own and use. That means that we are often able to source better value premiums than you’ll find on the high street. 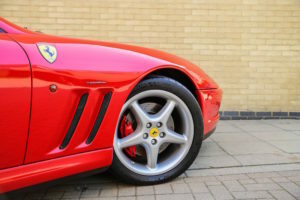 In fact, you could be surprised to discover that insuring your cherished supercar costs less than standard insurance on some less powerful models. If you do need to make a claim, our specialist team of claims handlers will take care of everything. And that can save you a lot of stress and hassle. Let us know what has happened and we’ll handle the rest, arranging for the repairs to be made and your car to be returned to you when it’s done. What can sports car and supercar insurance include? Our expertise and knowledge also extend to classic cars of all ages. That means if your supercar is also a classic, we’ll help you to find the right insurance to meet your needs. Off the shelf packages simply won’t cut it when it comes to supercar insurance. But there are specialist insurance companies that offer value for money insurance for your performance sports car that will also meet your high expectations. We have 30 years experience helping customers to find exactly the right supercar insurance for their needs. We’re independent brokers so can offer you impartial advice. Because we understand the unique needs of supercar ownership, we can build you a tailored package for your complete peace of mind. And if you do need to make a claim, you’ll have your own dedicated claims handler that makes it straightforward and hassle-free. Call our specialist team on 0117 9556835 or fill in the form below.